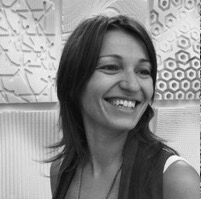 Areti Markopoulou is a Greek architect, educator and urban technologist working on the intersection between architecture and digital technologies. She is currently the academic director at IAAC in Barcelona, one of the leading international platforms for education. Areti is also co-editor of the Urban Next, a global network focused on rethinking architecture through the contemporary urban milieu, and is co-founder of StudioP52, a collective arts and tech gallery. Her research and practice design explores new architectural models that incorporate the application of ICTs, material intelligence and fabrication, allowing built and public space to dynamically adapt to behavioural and environmental changes over time. She has been developing urban projects and guidelines with the City Council of Barcelona and the Municipal Institute of Information for the implementation of ICT in the public space and the implementation of renewable energy technologies in buildings and open spaces. Areti has also served as a curator of international exhibitions such as the Pavilion of Innovation (Construmat 2015), MyVeryOwnCity (World Bank 2011) and Fabrication Laboratory (Barcelona Design Museum 2010). She holds a Bachelor in Architecture & Engineering from DUTH—Democritus University of Thrace, an MArch from IAAC, and a Fab Academy diploma on Digital Fabrication offered by the Fab Lab Network. She is currently a PhD candidate in the UPC, researching the topic of responsive environments and smart cities. Her work has been featured in numerous exhibitions worldwide, such as the Venice Biennale, Shenzhen Bi-City Biennale, Beijing Design Week, the 3D print show, and MaterFad, among others. Areti has served as an external examiner, visiting jury and lecturer in various universities such as the UCLA, SCI-Arc, NTUA, UPenn, BSSA, and AA, among others.